There’s no shortage of Barcelona hotels but as one of Europe’s most popular short break destinations the city is often full at weekends so it’s a good idea to book a place to stay well in advance. There are also a number of trade fairs every year which lead to the city’s beds being “sold out” months in advance. The majority of first time visitors to the city will find Barcelona accommodation to suit their budget on or near the Ramblas where there are properties ranging from small, family-run budget hotels to splendid four star lodgings. One area I’d recommend that you avoid is El Raval which is a run down and rather intimidating area running off the western side of the Ramblas. Below you’ll find our recommended Barcelona hotels according to star category. Many of the better class 4 and 5 star hotels lie in upmarket zones of Barcelona away from the touristy Ramblas zone so we’ve added a few of our favourites. Superb luxury hotel with an excellent restaurant and a rooftop terrace giving fine views over the city. One of the best hotels in Barcelona. This deluxe 5 star hotel is located in Barcelona’s Port Vell, perfectly located to explore the city. It is built on eight floors and includes 38 suites and an incredible Presidential Suite on the top floor with a private terrace and spectacular views of the city. The hotel is elegantly decorated and provides a luxurious atmosphere in which to relax. A charming hotel on the Passeig de Gracia with one of the city’s top restaurants and a superb rooftop swimming pool. Opened in 1992, the Hotel Rey Juan Carlos I is a member of “The Leading Hotels of the World”. It has since been enlarged and now rates amongst the top city complexes resorts in the world. Recent additions include the Royal Fitness, The Royal Catering and the Restaurant – Boîte Tatí. Check out Booking.com’s great deals on hotels in Barcelona offering easy access to the Ramblas and tourist centre. Excellent hotel in a beautifully renovated classic building on the stylish Passeig de Gracia. Very comfortable and welcoming hotel located in the city’s commercial district, away from the tourist centre. 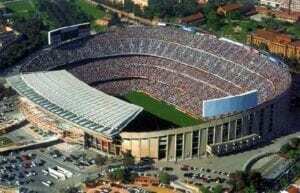 Ideal location for getting to Barcelona’s soccer stadium. A charming hotel situated right on the Ramblas near Plaza Catalunya in the heart of the tourist centre of the city. A comfortable hotel in the Gothic Quarter, popular for its location rather than its service. A superb hotel with a privileged location looking onto the Cathedral square in the Gothic Quarter. Our favourite in this area. Great value hotel with excellent central location. Superb panoramic terrace and swimming pool. Old style elegance just north of Plaza Catalunya at attractive prices compared with similar Barcelona hotels. Another excellent choice if you want to be where the action is. A hotel with plenty character located right on the Ramblas. Great views from its terrace and outdoor pool. This elegant hotel is located in the Gothic Quarter within easy walking distance of the Ramblas and the main museums. Its restaurant serves breakfast, lunch and dinner and allows guests the opportunity to sample some of the local cuisine. There is a roof top swimming pool where guests can relax or alternatively a gym where they can workout. Located directly opposite the cathedral in the Gothic area this hotel has easy access to all the main sights. Guests receive a complementary drink on arrival and there are fresh flowers in the rooms every day. There is a roof terrace with incredible views of the city and a jacuzzi and small gym on the same floor. This is a new and modern hotel located on Plaza Catalunya at the top of the Ramblas, within easy reach of all the main sights. It is very stylish and all of the rooms are tastefully decorated creating a welcoming atmosphere. There is a roof top terrace where guests can relax and sunbathe. Located in a fully renovated old building in the heart of the Gothic Quarter this is a perfect spot to explore Barcelona from. Guests are given free cava on arrival and there is complimentary tea, coffee and pastries available all day. Superb location in the heart of the Gothic Quarter and just a stroll from the Ramblas. Comfortable and convenient rather than remarkable. Located right on Plaza Catalunya at the northern end of the Ramblas. Ideal base from where to explore the city. This comfortable hotel is one of the best choices in the Gothic Quarter and is perfectly located for seeing all of the sights of Barcelona. This is an attractive hotel set just off the Ramblas in a quiet side street in an ideal location for seeing the sights of Barcelona. It has recently been refurbished but the public rooms have retained the original 19th century marble floors and chandeliers. An interesting alternative to staying in a hotel in Barcelona is to book an apartment for your stay. There are apartments to cater to the needs of all visitors to the city ranging from small two person flats to larger apartments suitable for families and groups of friends. A great advantage of the apartment option is that you don’t have to eat out all the time and if you find one near the Ramblas you can go shopping at La Boqueria market for a great selection of fresh produce. Take a look at this selection of self-catering apartments in Barcelona. Traditionally, family-run hostels in Barcelona have offered comfortable accommodation to the budget traveller. However, in a city with such an enormous demand for rooms many of the older places have undergone major refurbishments and now compete with small hotels at the lower budget end of the market leaving few cheap options to the visitor. To find out what’s available at the lower end of the budget scale take a look at these budget accommodation options in Barcelona. They vary greatly from simple, shared dormitories to tasteful, en suite double rooms. Like the city itself, the Generator Hostel Barcelona offers a great combination of style and substance. The hostel offers multiple shared and private room styles to accommodate the unique needs of its guests. Shared rooms include six-bed and eight-bed mixed dorms as well as six-bed female-only dorms. Private rooms range from single through quad styles and include private bathrooms. In addition to comfortable beds, the hostel offers a communal TV room and a 24-hour lounge that’s great for socializing and meeting new friends. Meanwhile, the multilingual staff is known for offering friendly service and great advice on how to take advantage of all the local gems. Located close to the Eixample, Generator Hostel Barcelona puts you right next to one of Barcelona’s trendiest districts. For those looking to combine the comforts of home with an authentic neighbourhood feel, definitely consider Casa Gracia Barcelona Hostel. Among the creature comforts available are comfortable beds, freshly made breakfasts, and spacious sleeping and bathrooms. In the communal areas you’ll find a fully equipped kitchen, huge exterior terrace for relaxing or sunbathing, and both salon and game rooms. As a brand-new hostel, the site offers tons of great shared and private room options, but the real highlight is its close proximity to many of the city’s major landmarks. From its location at the entrance of the Gracia neighbourhood, the hostel is located virtually down the street from sites like Plaça Catalunya, Arc of Triomf, and Park Ciutadella. 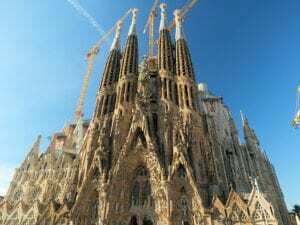 Other nearby destinations include the Segrada Familia, Port Vell (the marina), and tons of cafés, bars, and restaurants. Located near Las Ramblas, St. Christopher’s Barcelona is a top backpacker hostel that gives visitors a safe and inexpensive place to unwind. While twin and eight-person private rooms are available, the mixed- and female-only dorm rooms are definitely great ways to experience this location. Dorm rooms include hotbeds with privacy curtains, reading lights, power sockets, and a locker, while all guests have access to free Wi-Fi, breakfast, and comfortable bed linens. Some of the on-site entertainments include a mezzanine garden, in-house cinema, and a tasty Belushi’s Bar and Café just downstairs. Still, the fun and sun of the nearby beach is a lure that most guests will find hard to pass up. After all, there’s a reason that National Geographic and Discovery Channel put Barcelona at the top of their list of the world’s best city beaches. Catering to a younger crowd, the Be Sound Hostel prides itself on providing a fresh and vibrant environment. Between the available six- and eight-bed dorms, deluxe two-bedroom apartments, and the four-person private rooms, the hostel has 100 available beds. Guests planning extended stays will find the fully equipped kitchen and on-site laundry facilities refreshing, while virtually everyone will enjoy the 24-hour reception desk and in-room heating and air-conditioning. A great spot for backpackers, Be Sound Hostel is located only two minutes walking distance from Les Rambles, the port, and numerous shopping and nightlife options. Thanks to a friendly staff, free maps, and original tourist information, the location is a great jumping off spot for anyone looking to explore the wonders of Barcelona. This hostel reflects Barcelona’s burgeoning skateboarding and urban art scene, Sant Jordi Sagrada Familia offers a fun, friendly, and vibrant atmosphere. Available accommodations include modern apartment-style single- and two-person rooms as well as traditional multi-bed dorm rooms. With dorm sizes varying from four beds to 12 beds, guests have the choice of relative peace and quiet or a more interactive environment. As a hostel that emphasizes fun, Sant Jordi Sagrada Familia has plenty of amenities, including common rooms with comfortable sofas, big-screen TVs, and large hangout areas. Additionally, the hostel includes areas for skating, barbecuing, and relaxing after a night on the town. While the hostel is close to the Sagrada Familia Cathedral, many guests will find the hostel’s organized bar-hopping parties to be the best way to see the surrounding city.